We’re ready for the Fourth of July at the Rodriguez house! Ok, so it might be a month away, but it’s one of our favorite holidays. We always have fun dressing up and decorating for the occasion, and we’ve already been planning! Usually, I find us some American flag T-shirts, but this year’s gear is on a new level. Jammie Robertson from Spoiling Chloe online children’s boutique sent us an amazing patriotic outfit for each of the girls, complete with accessories. 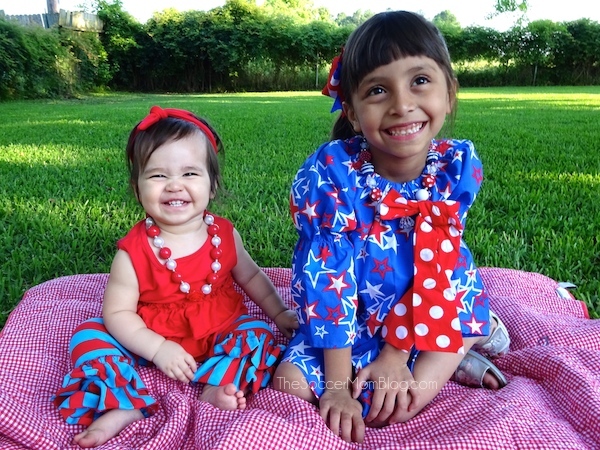 We couldn’t wait to try on their new Fourth of July kids outfits! Spoiling Chloe’s mission is to provide unique and affordable children’s clothing– nothing in the store is over $25. The selection is updated seasonally with holiday and themed outfits– right now there is an Elsa dress in stock that I know Lilu would beg for if she saw it! I waited patiently (for the most part) for the rainy spell we’ve been having here in Texas to finally go away so we could get outside for a festive photo shoot. The outfits were even more adorable on than I could have imagined– I LOVE LOVE how the pictures turned out and plan to have them printed and framed. The quality of the clothes is good, especially for the price. Even if you’re not spending a lot or it’s just an outfit to wear for a specific holiday, you want to know that the clothes will hold up and look nice. The girls played around in them for a bit after we finished snapping photos (Lilu was enamored with her USA-colored dress, necklace, and bow) and they looked no worse for the wear. 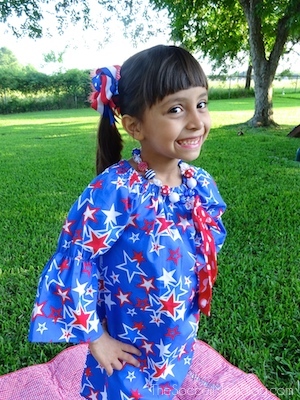 Lilu is wearing the July 4th Star Set and Annabelle is wearing the Ruffled Red and Blue Set– at post time, both are available in Spoiling Chloe’s online shop. 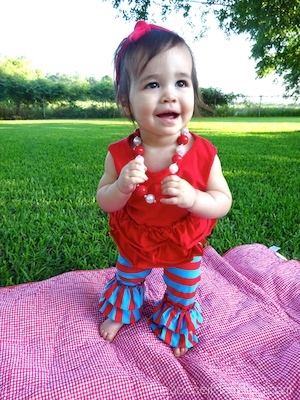 You can also purchase just the accessories (necklace and bow), and there is a beautiful Fourth of July baby tutu in stock as well. For the boys, there are fun super-hero capes and faux neck ties. I love the girls in these outfits, and definitely won’t reserve them just for the holiday– they’re too cute to keep in the closet all year. Plus, there’s never a wrong time to wear red, white, and blue! We were sent these outfits in exchange for an honest review– all opinions are my own. Read my full disclosure policy here.